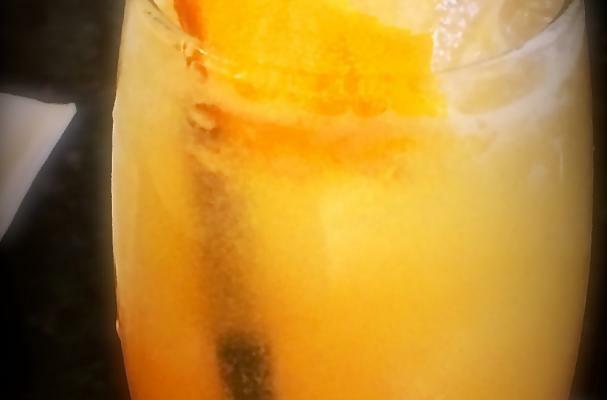 Foodista | Four Roses Whiskey Punch for a HOT Spring Day! I'm usually not in the punch mood until later in the season. But with that said, punch can be enjoyed in various formats all year round. A milk punch for instance is just fabulous for the day after New Year's Eve as it in the depths of summer. Or you may find yourself in the Caribbean on a yacht in the middle of the winter. What are you going to do? Pass up a bowl of rum punch because it is not summer yet? I really don't think so. Don't go thirsty on my behalf! I've included two versions here. One is my classic Whiskey punch made with none other than Four Roses Small Batch Bourbon Whiskey and the other is my famous Milk punch, made with the venerable Four Roses Yellow Label Bourbon. You should really try Four Roses. I've grown rather fond of it- in all speeds! Whiskey Punch... "Crossing South Street"
1/2 cup Lemon Juice - always freshly squeezed! Add 20 or so swigs of Angostura just before spooning..
Ice into your glass, add punch, drink.. I stuck to the tried and true (at least by myself) Historic Milk Punch. Crafted a la minute, my Milk Punch contains more than enough Four Roses Yellow Label Bourbon Whiskey to light up a small city. But you'd never know it by the amount of heavy cream, whole milk, vanilla and bitters in this drink. The real reason for making a Milk Punch is New Orleans herself. She is a lazy city that is enrobed in a veil of humidity. Time moves slowly and thirst is always a going concern. You must pour into your throat more than just water. You need to pour in vast quantities of dreams. This town is full of dreams. From the moment that you step off the plane and smell that aroma off the Mississippi, the smell of decay, you know that this town is all about dreams. The Milk Punch is a dreamy little drink for people who embrace New Orleans. Louis Armstrong, although living in New York, loved the Milk Punch and may have lamented that no one really embraced the Milk Punch in New York City as they did in New Orleans. The Milk Punch is a slippery reminder that cooling liquid drinks can pack enough punch to keep you interested. Certainly mine kept everyone who tasted it very interested. The ingredients for a New Orleans-style Milk Punch vary. They are historical in nature, but as far as pinning down a specific recipe, it's up for grabs which one is the most authentic. There are thick ones and thin ones and all sorts of punches for different times of the day. My Milk Punch is a thing of rare beauty on a hot morning. I love nothing more than wandering down the streets in New Orleans with a go-cup filled with a most intriguing concoction. The thing of my dreams and of my memories is this hand-held bit of paradise. It's hard to explain what it is like roaming the streets of New Orleans with a Milk Punch in hand. It is akin, I suppose, to an ice cold beer at a sporting event - not that I at all like sports - but it's what I think would be refreshing and satisfying while being poured down your throat. Stranger things have happened with Milk Punch. Going back to sleep when on New Orleans time is one of the side effects of a potent Whiskey Milk Punch. Mine falls into the latter category of mind-erasers that taste delicious. Which brings me back to that elegant bottle of Bourbon made with all-natural ingredients by people who care about the craft of Bourbon. I also like to add dry Vermouth to mine... This adds more of a herbaceous note to the traditional milk punch. Try it! It's different and delicious! 1. Add all the liquid ingredients except the bitters to a punch bowl. 2. Mix well to combine and scatter bitters over the top. 3. Chill in the fridge for an hour or so before serving. Don't add ice. Keep your ice in a separate bowl; you certainly don’t want to dilute this punch at all!! My THIRD Book, Bitters and Shrub Syrup Cocktails was just released!